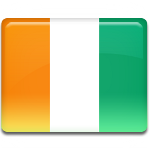 Independence Day is the major national holiday in Ivory Coast. It's annually celebrated on August 7, which is the anniversary of declaration of independence from France. France established its control in Ivory Coast (or French Côte d'Ivoire) in the late 1880s. Britain recognized French sovereignty in this area. In 1893 Ivory Coast became a French colony and its boundaries were finally determined. The first moves towards independence were made by Félix Houphouët-Boigny. In 1944 he formed the first agricultural trade union in Ivory Coast, that hired migrant workers to work on the farms. He rose to prominence very fast and within a year he was elected to the French Parliament in Paris. A turning point of relations between France and Ivory Coast was in 1956, when under the Overseas Reform Act a number of powers were transferred from Paris to territorial governments in Africa. In 1958 Ivory Coast became an autonomous member of the French Community and on August 7, 1960 it declared independence. Félix Houphouët-Boigny was elected the first president of Ivory Coast.